William H. Lock & Associates, Inc. is a North Carolina company dedicated to the art and science of professional forest management and the representation of our clients in the sale and/or purchase of rural real estate properties. Let us help you identify your objectives and accomplish your goals. Sound forestry advice will enable you to plan for the future and increase your profits. We are Professional Consulting Foresters working for YOU! We have successfully operated a family owned Consulting Forestry and Rural Real Estate business for over 30 years. We offer outstanding customer service coupled with professional expertise. If we had not met our clients’ needs and made them money, we would not be in business today. Be assured that our services will be available to you and your next generation. We are currently managing and harvesting timber we planted 25 years ago. Call us for a FREE consultation about your property to discuss your forest management and land ownership objectives. We offer complete “turn-key” jobs for timber inventory, marketing, harvest inspections, and reforestation. One phone call to our office will provide you with the peace of mind that all aspects of your timber management will be addressed. 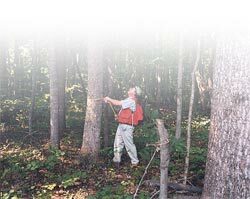 We prepare forest management plans, timber tax basis estimates, and timber trespass reports. We can provide timber growth models for future income projections. We offer expertise as Registered Foresters (NC, VA, SC, WV), Certified Foresters (National), Technical Service Providers (TSP) for the NRCS programs, Certified Arborists (National), Certified Prescribed Burners (NC), Tree Farm Inspectors (NC), and Real Estate Brokers (NC,VA).